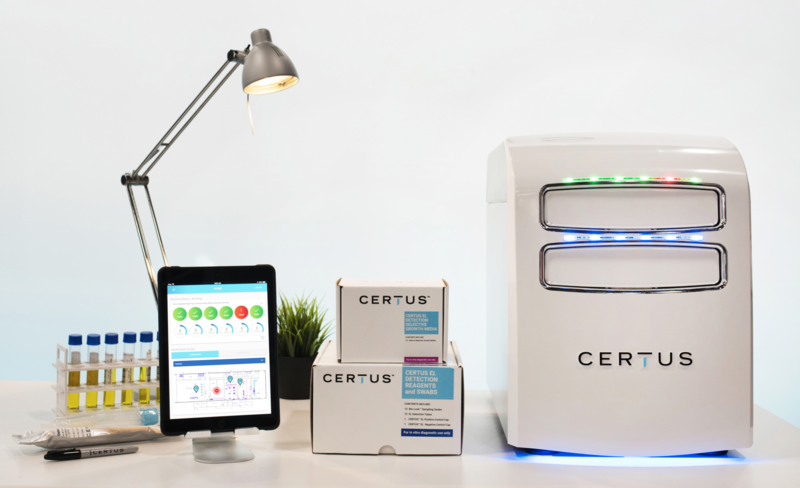 Pathogen Detection made simple with the CERTUS System. Revolutionary technologies and strategic partnerships make CERTUS an innovative leader in food safety. CERTUS makes the world a safer place to eat. The CERTUS System includes everything you need to perform fast, accurate, environmental monitoring in-house. No need for bags, stomacher, centrifuge, incubator, pipettes or bio-safe labs. Testing for pathogens is as easy as 1, 2, 3 with the CERTUS System. Simply collect your sample, insert into the Detection Unit, and the System does the rest! Now anyone in your plant can perform environmental pathogen testing. No specialized training is needed to use the CERTUS System. Simply collect your sample and insert into the Detection Unit following step-by-step directions on your Control Pad. The Bio-Lock Sampling Swab secures the environment from accidental contamination and enables you to move testing onsite for significantly faster results and reduced costs with no need for a laboratory or complicated technical training. The Bio-Lock Sampling Swabs are designed so that, once securely closed, forms a permanent seal that can’t reopen. Need to run additional samples and boost your quality control program? It’s easy with the CERTUS System. Sample collection and preparation takes only minutes, and with real-time detection, results are available in as little as eight hours. Robust performance and accuracy make the CERTUS System one of the safest pathogen detection systems around. 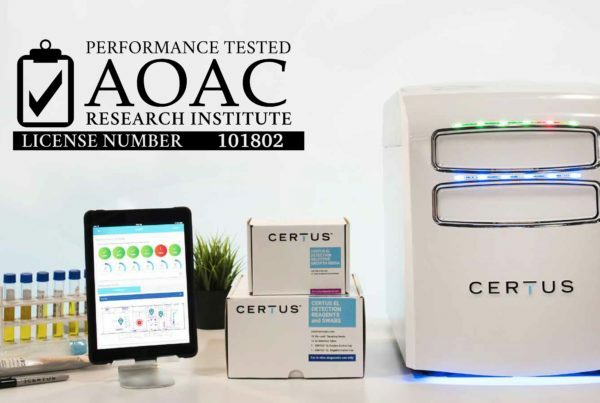 In test performance accuracy, the CERTUS System rivals systems currently on the market that are much more complex, have longer prep times and require expensive laboratories and technicians. The CERTUS System utilizes SERS nanoparticle technology for real-time detection. With 8 hour swab-to-result, the CERTUS System provides testing results within one shift – empowering food processors with the timely information they need to keep their products moving and protect their brand from a recall. Take control, take action and stay ahead. The CERTUS System comes equipped with complimentary facility management software. FSMA compliance has never been easier! Reduce labor and hard costs with the CERTUS System. No specialized training is needed to perform the simple 3-step workflow which takes only minutes from sample to test. Bringing pathogen testing in-house dramatically reduces shipping costs and specialty postage fees. Interested in learning how to integrate the CERTUS System into your facility? CERTUS now offers complimentary onsite consultations. The Detection Unit provides real-time detection for timely results and a proactive approach to environmental monitoring. LED indicator lights on the Detection Unit are color-coded to provide immediate notification of testing status. CERTUS’s consumable Detection Kits are pathogen-specific and contain everything you need for safe, in-house environmental monitoring. 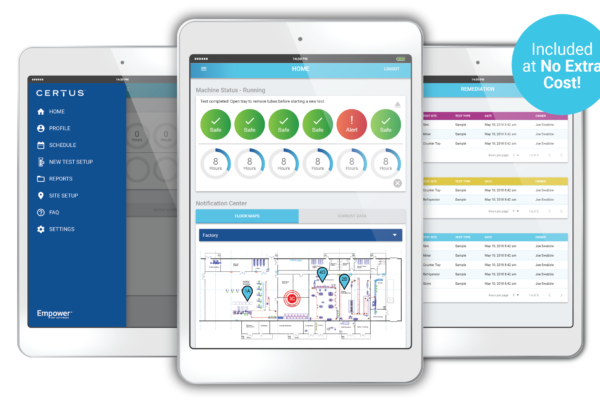 The CERTUS System includes a 9.7″ iPad equipped with facility management software for scheduling, mapping, notifications, remediation, reports and step-by-step instructions. Premeasured selective growth media simplifies the sampling process and enables anyone to perform environmental monitoring with minimal training. Once securely closed, Bio-Lock™ Sampling Swabs form a permanent seal that can’t reopen – making in-house food pathogen testing safe for your facility. Built for rapid, precise results, CERTUS’s new pathogen detection system provides a simple solution for in-house environmental monitoring in food processing plants. With CERTUS, you’re in control.